THIS AGREEMENT, made as of the _____________, 20__, between SPECIALTY RETAIL OWNER, LLC, a _________ limited liability company (the "Owner") and SPECIALTY RETAIL MANAGER INC., a _________ corporation (the "Manager"). Owner is the owner of that certain property located in _________, _________ and known as "__________ COVE MARINA," which includes a Marina ("Docks") and retail facility (exclusive of any restaurants) ("Building") (collectively, the "Property"). 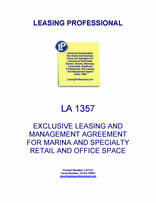 Manager desires to be engaged to manage and lease the Property and Owner has agreed to appoint Manager to manage and lease the Property under the terms and conditions herein contained. 1.1 Engagement as Manager. Owner hereby engages the Manager as an independent contractor to operate and manage the Property, and the Manager hereby accepts such engagement, all on the terms and conditions and subject to the limitations and restrictions hereinafter provided. As hereinafter set forth, Manager's duties shall also involve construction and other duties related to the development of the Property. 1.2 Engagement as Leasing Agent. Owner hereby grants to Manager the exclusive right to act as Owner's agent in connection with leasing of the Property during the term of this Agreement and Manager agrees to use reasonable efforts to effect the leasing of the Property in a manner consistent with such exclusive engagement. (e) secure, as fully as reasonably practicable, the compliance of tenants with the terms, covenants, and conditions of their leases, keep tenants informed of all rules and regulations affecting the Property, receive and promptly consider and handle service requests by tenants, and maintain systematic records showing the action taken with respect to each request. Manager shall not have the right, nor the obligation to initiate or maintain any legal or administrative proceedings on behalf of Owner without the prior approval of Owner. 2.2 Employment of Personnel. Manager shall have the duty, subject to the limitations set forth in this Agreement, to investigate to a reasonable extent (except that Manager shall not be obligated to perform more than a limited investigation of employees who earn less than $______ per hour and do not handle any monies on a regular basis), hire, train, pay, supervise and discharge the personnel necessary to be employed in order to properly manage and operate the Property in accordance with obligations of Manager under this Agreement. The Property will be staffed on-site with the personnel consistent with current levels. Such personnel shall in every instance be deemed employees of Manager and not of Owner. Manager shall be responsible for the compensation (including all benefits of such employees and for all payroll taxes, F.I.C.A. and similar items) with respect to such employees. The compensation (including benefits) paid to employees of Manager shall not exceed the amount ordinarily paid to employees for similar work in the area where the Property is located, or such other amount authorized pursuant to an approved Budget (as defined in Section 4.1), which Budget must exclude any compensation (including benefits) of any of Manager's officers or employees who do not work full time on the Property as well as any central office overhead or expense. Manager shall obtain, and maintain Worker's Compensation Insurance (including Employer's Liability Insurance) covering all employees of Manager employed in, on or about the Property, and provide statutory benefits as required by applicable state and federal laws with respect to Manager and Manager's employees. Manager shall directly control the time and manner of the work and services to be performed by the employees of Manager, and Manager shall comply with all applicable federal, state and local laws, ordinances and regulations applicable to such employees. Manager shall make all necessary payroll deductions for disability and unemployment insurance, social security, withholding taxes and other applicable taxes, and prepare, maintain and file all necessary reports with respect to such taxes or deductions, and all other necessary statements and reports pertaining to labor employed by Manager on or about the Property. If a Construction Contract is for less than $100,000.00 and pertains to, or is a component of, a construction job with a total cost of less than $100,000.00 and which is included in the Budget approved by Owner, Owner's approval shall not be required. All other Constructions Contracts must be approved by Owner. If a contract is for less than $100,000.00 is included in the Budget approved by Owner and is for a term of less than one (1) year or is terminable with or without cause, upon no more than 30 days notice. Owner's approval shall not be required. All other contracts shall be subject to Owner's approval. 2.4 Maintenance and Repair of Property. Manager shall maintain the Docks, the Building, appurtenances and grounds of the Property and other improvements thereon, in accordance with standards reasonably acceptable to Owner, including within such maintenance without limitation thereof, interior and exterior cleaning, painting, decorating, plumbing, carpentry and such other normal maintenance, and repair work as may be desirable; provided, however, the Manager's obligation and/or duty to maintain the Docks, the Building, appurtenances and grounds of the Property, and other improvements thereon, and the liability of Manager thereof shall be expressly limited hereby to the extent that the Owner provides sufficient funds for the satisfaction or discharge thereof or any expense to be incurred as a result thereof. For any individual item or repair or replacement, the expense must be specifically authorized in advance by Owner unless the item or repair or improvement was included in the Budget approved by the Owner, excepting, however, that emergency repairs immediately necessary for the preservation and safety of the Property or danger of life or property may be made by Manager without the approval of Owner, but Manager shall immediately notify Owner of any such emergency repairs.